Hardgrove Grindability Index Tester with 50g Feed Capacity - Gilson Co.
LC-100 Hardgrove Grindability Tester measures relative ease of pulverization of coals compared to standard coals in accordance with ASTM D409 Hardgrove Machine Method. The resulting Hardgrove Grindability Index (HGI) provides a measure of energy required in a grinding process or a measure of yield for a given energy input. A prepared 50g sample of No. 16—No. 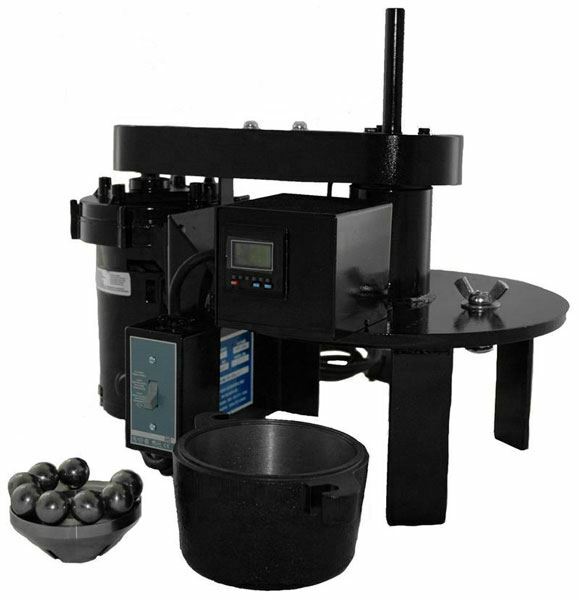 30 sieve size coal and eight 1in (25.4mm) diameter polished steel grinding balls are placed in a stationary bowl having a machined circular track. An upper grinding ring with matching track is rotated at 20rpm to drive the balls while a fixed load of 64lb (29kg) is maintained by weighting the motor-driven spindle attached to the upper ring. A counter/switch assembly automatically stops the tester after 60 revolutions, and amount of grinding is determined by sieving on a No. 200 sieve. The unit is made from durable steel and cast iron materials throughout to ensure reliable, maintenance-free operation. Upper and lower grinding elements and 8 grinding balls are included with each model. New Hardgrove units must be user-calibrated with a set of four LCA-30 Reference Samples having approximately 40, 60, 80, and 100 Hardgrove Grindability Index (HGI) values. The LC-82 Motorized Disk Mill (available separately) meets ASTM requirements for sample preparation for the LC-100.